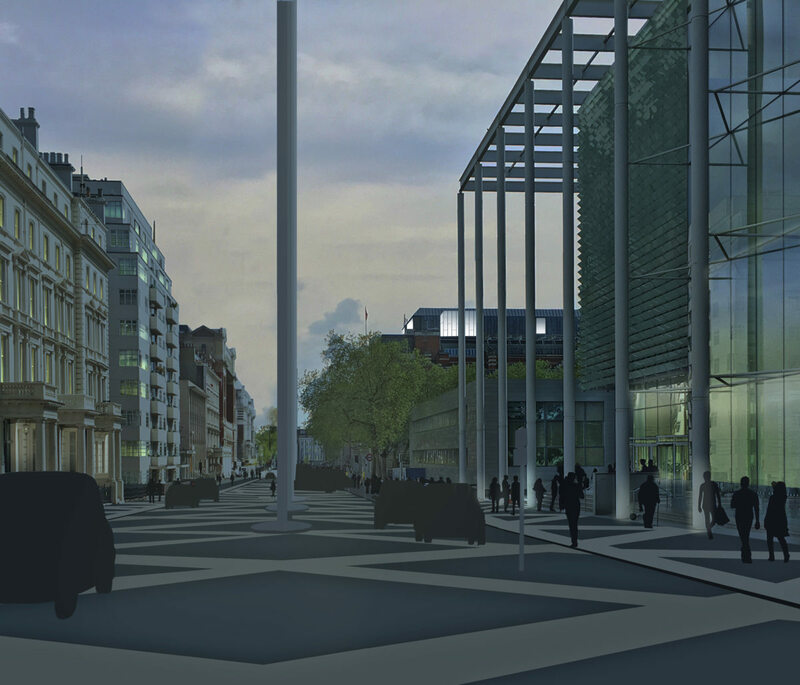 Alison Brooks Architects were amongst a shortlist of five to design a new event space inside the Science Museum in South Kensington. The Science Museum is one of the most engaging museums in London and takes in all aspects of human ingenuity celebrating our tools, techniques, and man’s never-ending capacity for discovery. 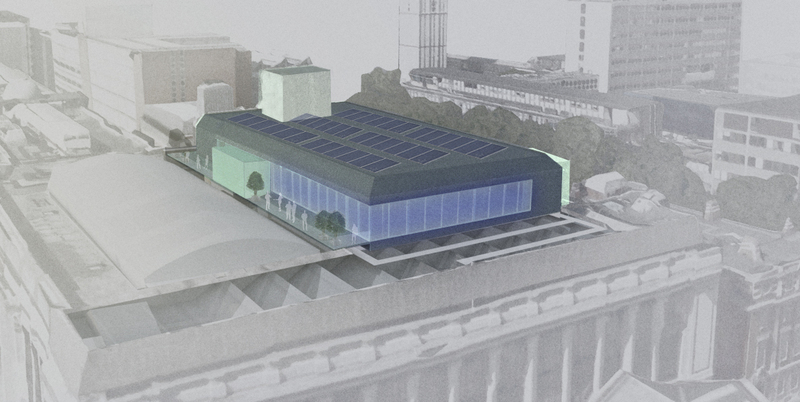 Our proposed scheme aimed to convey this adventurous spirit by offering a memorable, new spatial and curatorial experience for guests; two hugely flexible event spaces connected by a new double-height foyer that celebrated the museum’s artefacts and drew light deep into the plan. 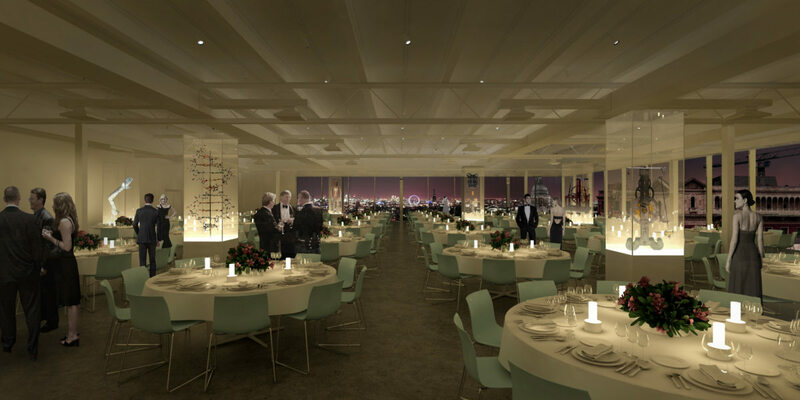 The two event spaces maximised the existing floorplate, offering panoramic views to the London skyline whilst minimising disruption to the building fabric. Arriving at the fourth floor lift lobby, visitors would emerge to encounter both the spectacular two storey high display and a grand staircase leading upward. 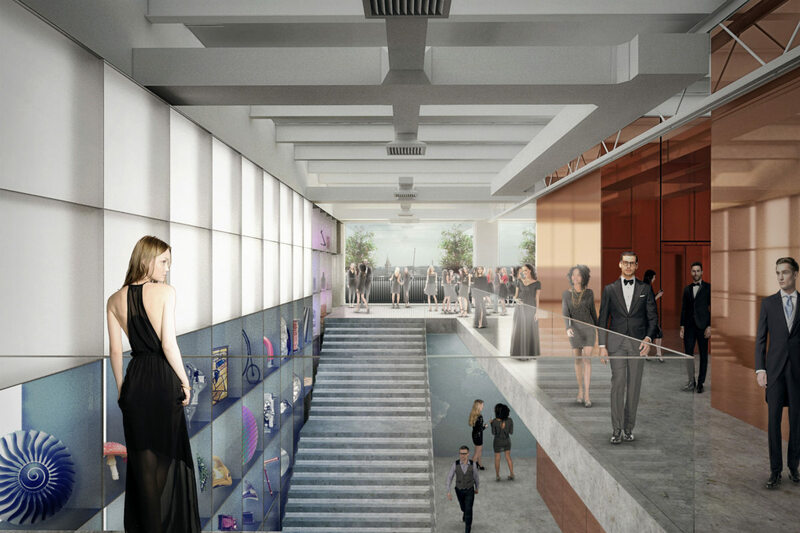 This double-height wall of artefacts: a huge three-dimensional ‘Periodic Table’ acted as a functional dividing wall to create a generous and much needed foyer between the lift lobby and events spaces, whilst at the same time provided a new opportunity to display objects from the museum’s vast collection. The new grand staircase offered a clear ‘processional’ connection between fourth and fifth floors, and a way of exploring the vertical array of objects in the ‘Periodic Wall’. 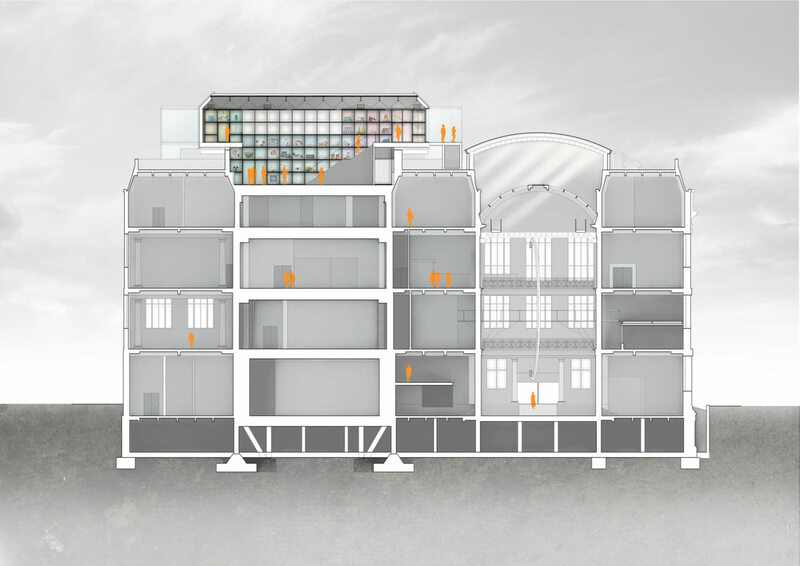 The staircase lead upward towards a huge new picture window at the top of the stair, opening to the 5th floor foyer – an opportunity for spill out space, a temporary bar, or access onto a south facing roof terrace. The full footprint of the 5th floor event space was retained, allowing visitors to stand ‘in the view’, offered by new glazed east and south façades 365 days a year, in any weather. Our scheme also provided an opportunity to create a balcony external to the event space. Our raw approach to this project, stripping the event spaces back to their concrete floors and structural elements offered maximum adaptability and atmospheric tailoring by customers.